CHANGES IN THE PRISON SOCIETY AFTER AT THE START OF WW II. The Polish historian Wanda Kiedrzynska gave an analysis of the proportion of women obtained from remaining transport lists with the red triangle at Ravensbrück at a total of more than 83 percent. This seems to be a realistic approximation, although the number on the percentage composition of the categories of prisoners in each year says very little. The largest national group of prisoners in Ravensbrück formed soon after the war began, were the Polish women. Already in October 1940 their share was almost a quarter of the total number of prisoners. This increased further in 1944 to 30 percent. The Austrian and Czechoslovakian women, in 1938 and 1939 were the first foreigners that came to the camp, although the Austrians were included as Germans in the official statistics it did not reach this magnitude. With the advance of the army in the west and north since 1940/41 for the first time women from Scandinavia, France, Belgium, the Netherlands and Luxembourg, were brought to Ravensbrück. Large groups of them were, however, only in the years 1943/44 in the camp, as the actions of resistance against German occupation forces won support under the civilian population in those countries concerned and reached a level importance to participate in the fight against the invaders..
After the invasion of the Soviet Union in the fall of 1941 came the first Soviet women to Ravensbrück. With a share of more than 21 percent of them they were the second largest group in the prison society. Compared to the Poles, however, they were not a homogeneous group. Most were young laborers (many between 14 and 16 years old) from Russia, Ukraine, Belarus and the Baltic States that had allegedly or actually disobeyed any orders proclaimed or given, either because they refused to work or simply left their specified place of residence. In addition there were at least 700-1000 POW Red Army Women (Rotarmistinnen) who were brought in February 1943 from POW camps to Ravensbrück. 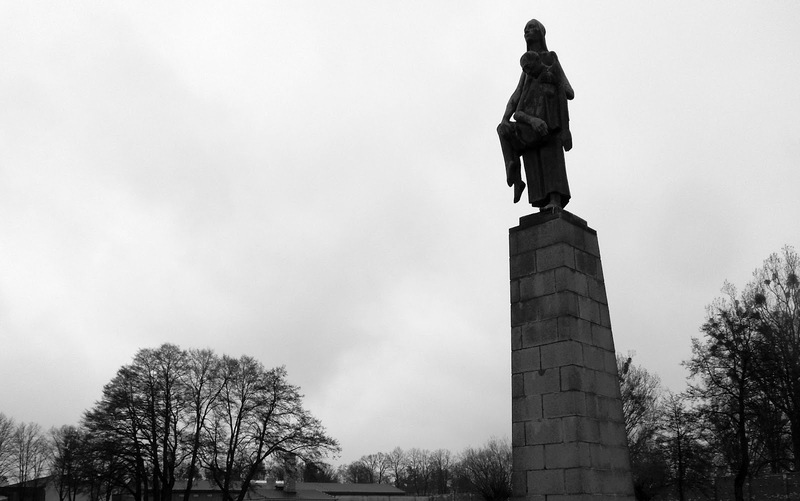 [Bernhard Strebel noted that about 700 female prisoners of war of the Red Army can be found in the lists. However, their total number amounted in fact to about 1000,sic] They had refused to take off their uniforms and to be recruited as a civilian forced labourers. Germaine Tillon In her memoir makes a sharp distinction between these two groups. With great distaste, she reports of the young forced labourers, who were in the camp especially noticed "because of their skill at stealing". The Ukrainians also made themselves unpopular with fellow prisoners with their unspeakable cruelty. [I could not find any reference to the type of cruelty they allegedly had committed, sic] In contrast, the captured women soldiers with their disciplined appearance throughout, received the admiration and sympathy of others. "We loved them and their attitude of resistance against the Germans," writes Tillon. On 6 October 1942 by order of Himmler with the last transport of 522 Jewish women which went to Auschwitz-Birkenau, the women's concentration camp was "free of Jews"(judenfrei). The majority of Jewish prisoners of Ravensbrück, about 800 had already been deported in the spring of 1942 into the medical and nursing home of Bernberg and there within the framework of "Aktion 14 f 13" murdered. In the summer of 1944, however, as more and more labourers were needed in the armaments industry, again a large number of Jewesses from Auschwitz or its satellite camps arrived at Ravensbrück. At the end of 1944 beginning 1945, with the advance of the Red Army eventually the concentration camps in the east had to be abandoned. Hungarian and Slovak Jewesses were deported during this time directly to Ravensbrück. 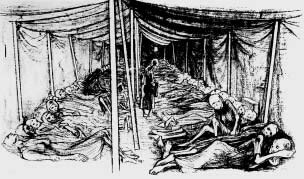 Thousand of women and children, no exact figures is known, weakened by hunger and hardship arrived in the completely overcrowded women's concentration camp, where they had little chance of survival. A similar thing happened to a much smaller group of Sinti and Roma women, only in reverse. They were deported to Auschwitz from Ravensbrück, where many of them were victims of medical experiments. Just before the "Gypsy camp" at Auschwitz was disbanded in May / August 1944 and its occupants were killed, few of the women for some reason came back to Ravensbrück. In June 1940, a year after the opening of the women's concentration camp at Ravensbrück, which was planned for a maximum number of 3000 prisoners already exceeded this figure at that time. In subsequent years, the capacity of the camp was expanded continuously, but the construction of the necessary barracks could not keep in step with the escalating number of prisoners. In January 1944, Ravensbrück with approximately 17300 prisoners was already overcrowded. By December, the number had risen to about 43700. For the majority of the prisoners at that time there was no immediate danger of death. Recorded details by Margarete Buber-Neumann indicate 47 women died during the first year of their stay in the camp (August 1940-August 1941) of whom more than half succumbed in the cells as a result of increased detention or ill-treatment, apart from that during the last year [of the camps existence,sic] about 80 prisoners died every day. The executed and murdered in the gas chamber, she had not included. The French chronicler Germaine Tillion, who were given secretly by some inmates recorded death statistics in conjunction with incoming Transport Lists (which were not reliable) for the year 1940 a total of 84 dead. In 1943 it numbered about 460 officially registered deaths (excluding death-transports to the gas chambers). Later on she maintained the mortality rate on a monthly basis, for the year 1944 Germaine Tillion recorded the death toll as: 120 women died in January, in December it was 811. These figures give an idea of ​​how dramatically the living conditions of prisoners in the last two years of the war worsened. As of late summer and autumn of 1944 Hungarian and Slovak Jewesses, also an additional 12 000 women and children after the suppressed revolt in Warsaw arrived in Ravensbrück. To ease the overcrowding a 50 metre long tent was erected between two barracks, where up to 3,000 women and children without any blankets were housed on only a thin layer of straw lying on the ground. The inmates were totally exhausted with no water, no sanitation or medical care and received in the first few weeks only bread to eat. "In late 1944",Margarete Bober-Neumann wrote: "Ravensbrück sank slowly to the level of Karaganda in the Sowjet Union". FORCED LABOR AND FURTHER DEVELOPMENT OF THE CAMP. In the first two years of the camp, the labour of prisoners had not been systematically exploited for the war effort. The work at that time were mainly the erection of barracks and further expansion of the camp as well as general maintenance. At other work details the women performed hard physical labour in road construction, the grading of the sites, the embankment of the lake shore and the construction of new facilities. 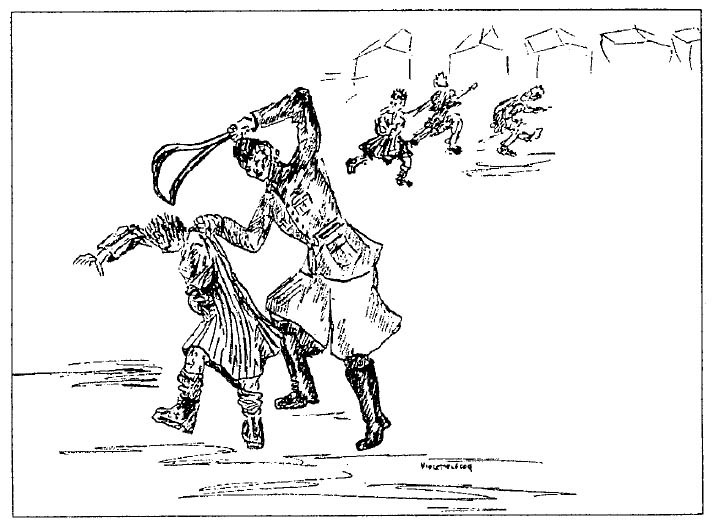 In some of these dreaded commandos, in which women were subjected to harassment by the SS-supervisors and their own overseers and exposed to the weather, especially those that had just arrived, the newcomers, and prisoners who were categorised by the SS as the dregs of inmates, thus at the bottom of the hierarchy. 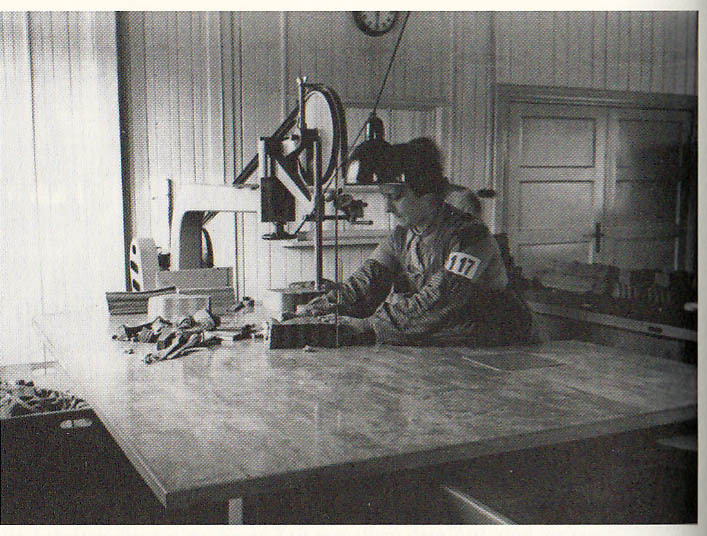 In the workshops, women were engaged in "typical" female activities. They sewed, did weaving, knitted and, at first mainly for the needs of the camp, that is, they made camp uniforms. 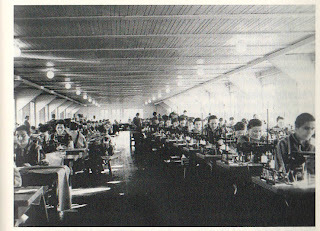 1940 the SS founded, the "Enterprise for Textile and Leather Recycling mbH" (Texled) to the exploitation of the prisoners so they could operate more efficiently. The camp of Ravensbrück hired out prison labour to others for money making reasons and forwarded the profits to the SS (WVHA) Administrative Main Office. [Strangely enough, profit was considered a Jewish habit and frowned upon in general by the Party,sic] The existing camp workshops were incorporated into a newly established operations, which included an Angora rabbit breeding program, a skinning/pelting and a straw braiding shoe department. Since 1941, the capacity of Texled was constantly expanding. First built in the industrial yard, which had three new barracks. 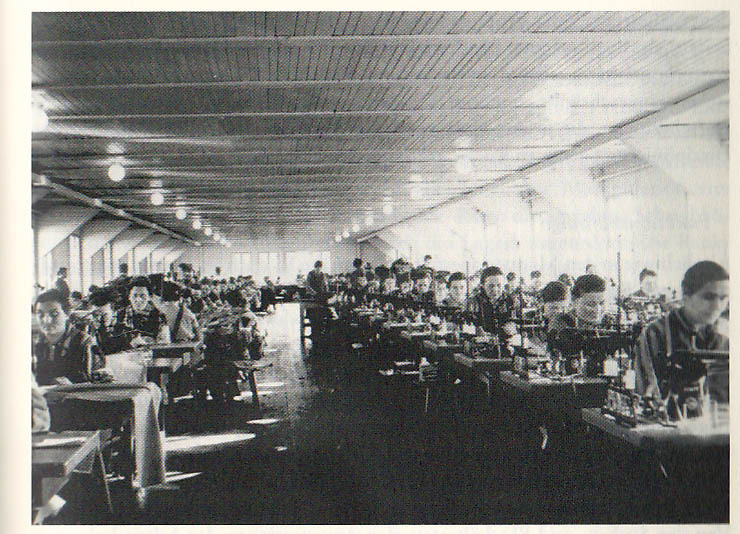 It was followed by 1942, of the construction of a large hall complex for spinning,weaving and tailoring for large-scale processing of "textiles", in other words, the clothing of murdered people from extermination camps was planned. It did not eventuate that far, as a result of the war and the shortage of machines, it probably just had a tailoring unit, which produced in addition to prison garments, especially uniforms for the SS. Overall, the inclusion of concentration camp prisoners in the war production since 1942/43 was inconsistent and controversial . On the one hand, the pace of work intensified, working hours increased dramatically, it became a multi-layer working shift system that had been introduced and it was no longer free on a Sunday. On the other hand, however, the survival rate for able-bodied and healthy prisoners increased, partly with the approaching front line and retreating German Forces, there was less of an influx of forced labourers from occupied countries and less overcrowding. Labor availability of the inmates from concentration camps became of importance. Thus, the hours spent standing for hour-long roll call was limited, senseless harassment and abuse by guards, who had been in the early days of the camp an important element of discipline, receded into the background. Germaine Tillion was a French anthropologist, best known for her work in Algeria in the 1950s on behalf of the French government. 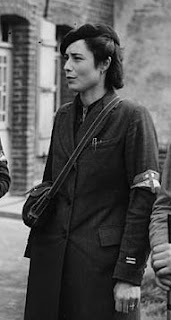 As she came back to Paris from the field, France had been defeated and, Germaine Tillion turned into one of the leading commanders in the French Resistance in the network of the Musée de l'Homme in Paris. Her missions included helping prisoners to escape and organising intelligence for the allied forces from 1940 to 1943. Betrayed by a priest, she was captured and sent to the German concentration camp of Ravensbrück, near Berlin with her mother, Émilie Tillion, also a resistante. From her arrival on 21 October 1943 to the fall of the camp in Spring 1945, she wrote an Operetta, called "Le Verfügbar aux Enfers", a comedy describing the poor life of the "Verfügbar"(Available) in the world of the camp, to help the other survivors to have fun, at the same time undertaking a precise ethnographic analysis of the concentration camp. In 1973, she published Ravensbruck: An eyewitness account of a women's concentration camp, detailing both her own personal experiences as an inmate as well as her remarkable contemporary and post-war research into the functioning of the camps, movements of prisoners, administrative operations and covert and overt crimes committed by the SS. 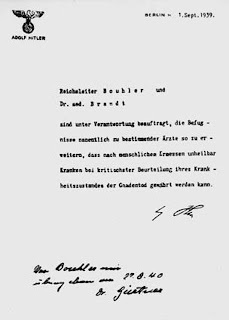 She reported the presence of a gas chamber at Ravensbrück when other scholars had written that none existed in the Western camps, and affirmed that executions escalated during the waning days of the war, a chilling tribute to the efficiency and automated nature of the Nazi "killing machines." 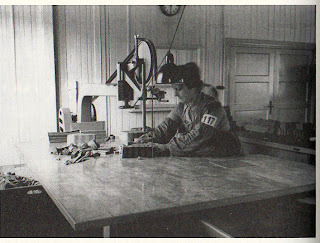 She documents the dual but conflicting purposes of the camps; on the one hand, to carry out the Final Solution as quickly as possible, and on the other, to manage a very large and profitable slave labour force in support of the war effort (with profits reportedly going to SS leadership, a business structure created by Himmler himself). Finally, she gives chilling vignettes of prisoners, prison staff, and the "professionals" who were central to the operation and execution of increasingly bizarre Nazi mandates in an attempt to explore the twisted psychology and outright evil behaviour of often average participants who were instrumental in allowing, and then nurturing the death machines. As in other camps, the SS-men installed in the women's concentration camp Ravensbrück a so-called Prisoner Self-Government,(Häftlingsselbstverwaltung) the representatives of the various areas of the camp acted on their behalf. With the help of inmate functionaries, who did the monitoring of camp activities, from daily chores, took over and assigned work allocation, performed punishments and invoked penalties. For a relatively small number of guards, the SS were in a position to control thousands of prisoners. At the same time, this was a perfidious system that should prevent solidarity among the prisoners. As in all concentration camps the Prison Self-Government in Ravensbrücks was built on the mirror image based on the structure of the SS Guard Personnel Manual: It started with the Room Orderly, then the Block Elders, the Forewomen (Anweiserin) to the labour gangs (the term "Kapo" was in the women's camp not in use) on the lower level of the central functions, the infirmary, kitchen and laundry, the positions in the individual writing rooms, the labour input and at the top of them all the so called Camp Managers (Lagerläuferinnen) and Camp Elders (Lagerältesterin). In memoirs of the survivors the Camp Elder is not given in the Ravensbrück a prominent role, as for example in Buchenwald and Sachsenhausen. The historian Bernhard Strebel explains this with the slightly different organisational Structure in Ravensbrück concentration camp. There, the officer in charge imputed the Senior Women Superintendent (Oberaufseherin) responsible for the connection between the SS and the prisoners. With the increase in the number of prisoners at Ravensbrück in 1942, similar to other concentration camps, a camp police was formed, which was armed with truncheons and took charge of the internal camp security and backup tasks. While in Buchenwald, a strong political resistance existed to form but on their own initiative, and organise the "camp protection" and literally presented the SS a functional Unit for approval, the Ravensbrück camp police was initiated by the SS, they specified initially as applicants primarily German and Austrian women with green triangles. 1944/45 German political prisoners, Czech, Poles and Yugoslav women were represented in the camp police. Another feature of the Ravensbrück inmate self-government was the lack of a central, almost independently acting prisoners' office, this would have offered functionaries the possibilities to manipulate instructions and obtain data. In Ravensbrück, the individual writing offices were assigned to each camp administrative division. The prisoners worked under the supervision of the SS personnel. Most women who took such functions, [i.e.Functionaries, sic] it was a multiple dilemma in which they fell, at first, unaware of: for better food, relief from heavy physical work, an own bed and other benefits could take them into the orbit and service of the SS. At the same time they were at risk, exposed as simple prisoners. They were responsible for rule violations in their area and could be severely punished, if regulations were not adhered to. This led inevitably almost in contrast to their fellow inmates. If they lost the favour of the SS, they also had to fear the vengeance of their fellow prisoners. The compulsion to function and be involved as an arm of the SS and their crimes, had to be constantly weighed against the opportunities to alleviate some hardships for others, and to pass on warnings to help fellow prisoners. The judges in the early post-war trials dealt with the prison functionaries very harsh and did not take a "forced situation" of the accused into consideration. But apart from that, today one can hardly be objective of their judgement on the basis of very different recollections of the survivors, which functionary or forewoman was "good" or "bad". Since the "Bible Students"(Jehovah Witnesses) as a combined group refused to assist with any type of work in supporting the war effort they were barred from obtaining any positions as functionaries, which had been dominated since about 1943 by communists, especially from Germany, Austria and Czechoslovakia, together they held the most important places in the administration. The Poles occupied the functions on the lower level, in other words communists took all the central position, [not the criminals,sic]. French and Russian women who had come at a time into the camp, when the most important posts were already occupied by the long-term prisoners, held in comparison to their numerical importance very few functions. While Roma women were excluded from all functions and thus had very little opportunities to improve the living conditions for their little group. Jewesses were allowed to become in the first years block leaders within their own barracks. In the last phase of the war, this practice changed, however onerous. 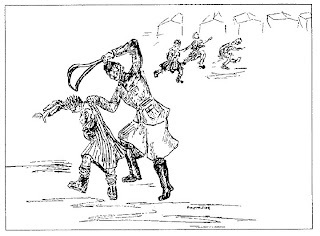 Now, Jewish prisoners were able to take over functions within the camp police, in the office, and direct the use of labour in their assigned area. In the sub-camps, were mostly Jewesses were interned, they eventually occupied all functions, including that of the camp elders. JOHANNA LANGEFELD was a German female guard and supervisor at three Nazi concentration camps. Born in Kupferdreh (now in Essen, Germany), Johanna Langefeld was brought up in a Lutheran, nationalistic family. Her father was a blacksmith. In 1924 she moved to Mülheim and married Wilhelm Langefeld, who died in 1926 of lung disease. In 1928 Langefeld fell pregnant with another man, left him soon after and moved to Düsseldorf where her son was born in August of that same year. A woman who was an exception as a block elder and was respected by her fellow inmates was the Austrian Social Democrat Rosa Jochmann, who controlled from 1940 to 1943 the political block I. This block was used because of its exemplary order and cleanliness as a show-piece for visiting "guests". Many women reported later unanimously Jochmann had used with great courage, intelligence and tactical skills to improve the life of her mates. According to her own statement, she did much to protect prisoners from rule violations and did not report them to the block leader. Due to her easy access to the upper echelon of the SS and her congenial relationship with the Superintendent Langefeld many of her requests were met. After the transfer of Johanna Langefeld she fell victim to denunciation and was sentenced for six months "Bunker" from which she emerged half starved. To be viewed as the extreme opposite of Rosa Jochmann there can be no doubt was the much-feared and hated Inmate Block Elder Maria Carmen Mory. The Swiss came in October 1943 to Ravensbrück and was first Room Elder, in October 1944 she was appointed Block Leader of barrack 10, where tuberculosis patients and mentally disturbed prisoners were herded together. Mory had operated in the late thirties in Paris by order of both, the German Military and Gestapo as an agent and asked to spy on German immigrants as well. She was apprehended by the French Security and sentenced by a court to death, but pardoned upon appeal. Why the Germans after they invaded France arrested her, remains unclear. 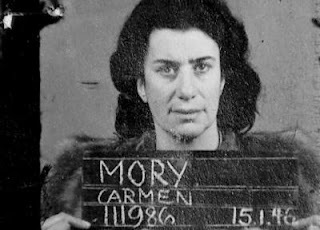 During the first Hamburg-Ravensbrück trial in 1946/47 Carmen Mory was sentenced to death and took her own life the night before the execution. Inmates had alleged that she had acted cruelly and ruthlessly against the sick women in her block, only to have arranged favourites to the ones she liked and operated as a spy for the Gestapo within the camp. As a Functionary in a block with tuberculosis prisoners where hygienic conditions were disastrous, and in which the mentally ill women vegetated in a "little room", her behavior was completely out of step and considered inhuman. She was found repeatedly present in her block in the final selection stages of patients for extermination transports to other camps. In these actions, however she apparently did not personally take part in. That Carmen Mory had helped some inmates, that she was temporarily detained in the Bunker and and received floggings, was during the trial ultimately meaningless. Decisive were the statements of French women and German communists, two powerful groups, the image of the "bad" Block Elder with her predicament that she acted under duress as a prisoner herself (Zwangssituation) was never a subject of discussion during the trial. Carmen Mory was born 1906 as the daughter of a physician in Adelboden. She had to give up her original career and aspirations as a singer after a throat operation. Beyond such clear attributions in taking over a function in the self-government for all concerned was always a balancing act between the excesses of the SS and the expectations of different prisoner groups. The two political prisoners Berta Teege and Louise Maurer, who were 1941/42 camp elders reported after the war, they had in the spring of 1942 received an order to report all sick women in the camp. They distrusted the assurance that the persons would be moved to a "sanatorium" and asked the Oberaufseherin(Superintendent) Johanna Langefeld, to release them from this task. It later emerged that the transport was destined to the gas chamber of Bernberg. With such a refusal both functionaries risked to be placed in the bunker or the punishment block. In this case, however, Langefeld entrusted the task to the Supervisors (Aufseherinnen), without mentioning Teege and Maurer for punishments. Margarete Buber-Neumann reported on the former prostitute and forewoman Else Krug who did time for a rule violation in the winter of 1941/42 in the punishment block. 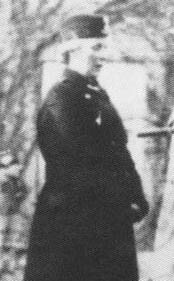 When the camp commander Max Koegel ordered her to carry out the flogging of prisoners, and in return she would be released from the block, she refused. "Else Krug went back into the punishment block. A few weeks later she was sent in an ambulance transport to be gassed. Else knew where it went and also that it was Koegels revenge." sind unter Verantwortung beauftragt Befugnisse namentlich zu bestimmender Ärzte so zu erweitern, dass nach menschlichen Ermessen unheilbar Kranken bei kritischer Beurteilung ihres Krankheitszustandes der Gnadentod gewährt waerden kann. For the concentration camp at Ravensbruck, there is little evidence on the controversial practice of " sacrifice exchange"(Opfertauschs) as handed down by function prisoners in Buchenwald and other camps like Natzweiler-Struthof. Typist-Clerks from the Work Area Service Department, it is alleged, would alter and change the names sometimes of vulnerable inmates and given them names and numbers of deceased prisoners and sent them with transports to a satellite camp, where they would be safer. But apparently this had little success, to manipulate the 1944/45 established lists for extermination transports. 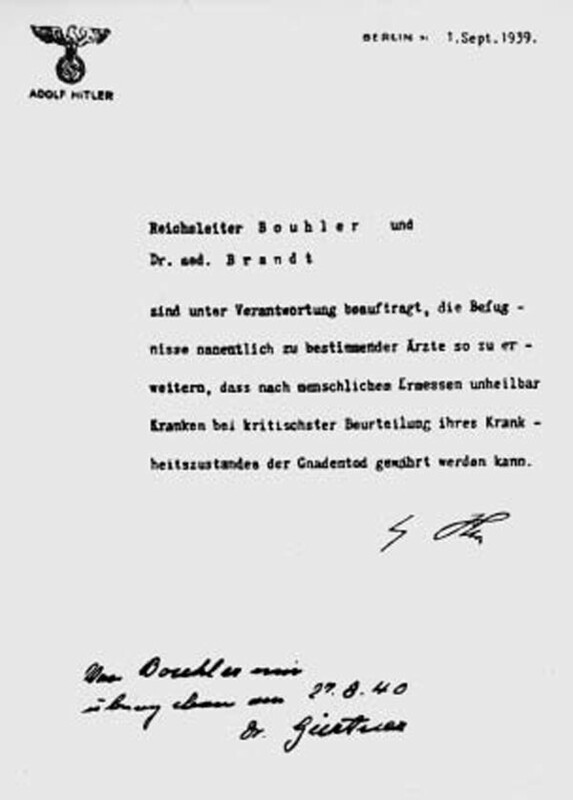 Only the Austrian Revier-Runner(Revierläuferin) Antonia Bruha reported in her memoirs, how she deleted and crossed out in 1944 the names of about 50 long-term political prisoners from a transport list for the death camp at Uckermark and replaced them with names of terminal ill women. The outcome of the story remains unclear. Apparently the SS doctor Percy Treite himself eventually completed this list.